Hong Kong Is About to Defy the Chinese Government. What Happens Next? 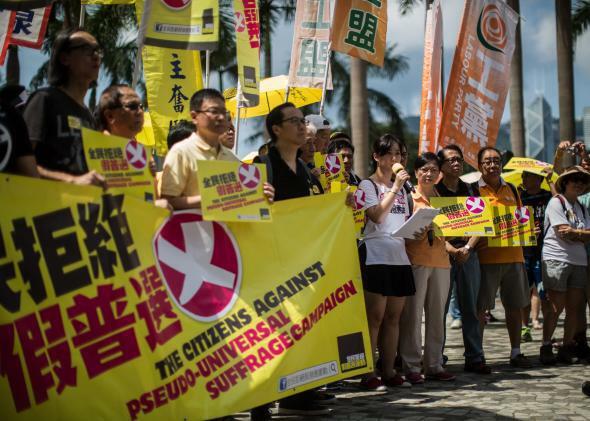 Pro-democracy activists rallying against a controversial political reform package in Hong Kong on June 7, 2015. It’s been unclear for some time how Hong Kong would pull off its planned transition to full democracy, while at the same time becoming increasingly integrated with a mainland China that shows no signs of becoming less autocratic. At the moment, it appears it can’t. This week, Hong Kong finds itself on a collision course for a dramatic confrontation with the mainland Chinese government as its legislature debates a controversial reform to Hong Kong’s election system amid protests and mysterious threats of violence. The proposed changes, which would give Hong Kong residents the right to elect a chief executive but only from pre-vetted, pro-Beijing candidates, sparked the weeks of mass protests that became known as the Umbrella Revolution last year, when they were first announced. If, as expected, the legislature rejects the proposal, no one’s exactly sure how Beijing will react. Under the “one country, two systems” arrangement put in place when China retook control of the city from Britain, Hong Kongers enjoy far more political freedom and civil liberties than mainland Chinese citizens, but their government is only quasi-democratic. Only half the seats in the country’s legislature are popularly elected. The other half are selected by business and trade groups that generally skew pro-Beijing. These groups also make up the committee that elects the city-state’s chief executive. Hong Kong is due to transition to universal suffrage for both the legislature and the executive by 2017, 20 years after the handover, but under the controversial model proposed by Beijing last year, the election committee would still have to vet the candidates before voters got to choose. The “pan-democrats”—the bloc of political parties who want more independence from China—view this as a sham and a betrayal of the principle of universal suffrage. One lawmaker called it a “maggot-eaten apple” this week. Thousands of protesters have returned to the streets this week as the legislature has taken up the proposal. Polls suggest about 47 percent of Hong Kongers support passing the proposal, with 38 percent against and 15 percent undecided. At least some of the support probably has less to do with genuine enthusiasm for the idea than for a desire for stability and fatigue after last year’s unrest. Adding to the atmosphere of unease, 10 people were arrested in Hong Kong this week for what authorities are calling a separatist bomb plot after they were found with explosive materials. Pan-democrats are skeptical, suspecting a government smear campaign behind the arrests. The city hasn’t seen serious political terrorism since the anti-British leftist demonstrations of the 1960s. At the moment, the reform seems unlikely to pass when it comes to a vote later this week. It needs a two-thirds majority in favor, and the pan-democrats, who control slightly more than a third of the seats in the legislature, aren’t going to budge. What comes next is a little unclear. If Hong Kong doesn’t pass the reform, the chief executive will continue to be selected by a committee stacked with pro-Beijing loyalists, and Chinese leaders are unlikely to offer further concessions. If the 2017 deadline passes without Beijing delivering the democratic reforms it promised when it took over the city from the British, that will probably spark more protests from the pan-democrats. Since it took over control of Hong Kong in 1997, China has generally been willing to tolerate the city’s political independence in return for the economic benefits it brings in as a major financial hub and home-base for many of the international companies that invest in the mainland. But the patience of China’s increasingly powerful President Xi Jinping may be wearing thin.